Following my prior posting Dental Serious Games with 3D Touch, here is another serious game giving dentists-to-be practice time on virtual teeth. Research shows that healthcare providers who practice clinical skills via simulation have better patient outcomes than those who don't. The Virtual Dental Implant Training Simulation is designed to help students in diagnostics, decision making and treatment protocols. The implant simulation game uses multiple patients and clinical scenarios that can be randomly selected, letting students interact with virtual patients by asking about their medical history, examining them and arriving at a diagnosis. Like humans, the virtual patients have different personalities, and students must tailor treatment based on the mental, physical and emotional needs of the individual. If the virtual patient is a candidate for implant therapy, the simulation then ventures into a virtual clinical treatment area, where students decide the type, location and orientation of the implants, type and location of anesthesia and tools for surgery. Video games may be good for your dental health. Not for the jaw-clenching or tooth-grinding action -- discuss these conditions with a professional if they persist in conjunction with gaming -- but because dentists will soon have access to virtual mouths before they get their hands on your chompers. 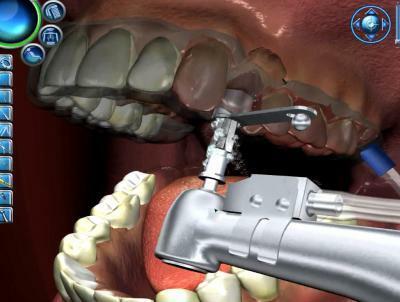 The Virtual Dental Implant Training (VDIT) Simulation is now in beta testing, and set for rollout next fall, when it will reach about 15,000 dental students in 25 universities around the globe that partner with Nobel Biocare of Sweden, the project's funder. Developed by Maryland-based game developer BreakAway in concert with the Medical College of Georgia, VDIT uses entertainment technology to simulate real-world scenarios. Dr. Roman Cibirka, Vice President for Instruction and Enrollment Management Associate Provost for Academic Affairs, put the wheels in motion 18 months ago, after he attended a Games for Health conference. This year he presented VDIT at the gathering in Boston. The digital interface lets dental students put classroom lessons into action and build on the training they've done with medical mannequins. Cibirka said increased opportunities to exercise hands-on-mouth skills lead to better outcomes, on both sides of the dental chair. Speaking from Breakaway's high-security offices (the company has top-level security clearance because of its contracts with the military), producer Isaac Jeppsen said he situated the action in the dental office -- and in the patient's mouth -- to make it less complicated for first-time gamers. "You don't need to navigate down the hall and move into an office, you start the game where you need to be," said Jeppse: looking at a patient ensconced in a dental chair. He created a mouth, brought drills to life and input a series of questions that allow players to assess their patients' conditions before setting drills in motion. Dentists-in-training start each round of the simulation game with a question-and-answer intake session to figure out if the person in the chair is well suited for an implant. Neglecting to ask a pixelated patient what brought her to the dentist will cause a player to fail. "There's a very solid body of evidence that there are basically four patient profiles," said Cibirka. Those four profiles were starting points for the patients who appear in VDIT: two women and two men of different ages, backgrounds, personalities and implant considerations. A prosthodontist -- specializing in bridges, crowns, implants, and dentures -- by training, Cibirka is familiar with the pitfalls that can trip up both new dentists and experienced practitioners (the latter have also exhibited an interest in the simulation). 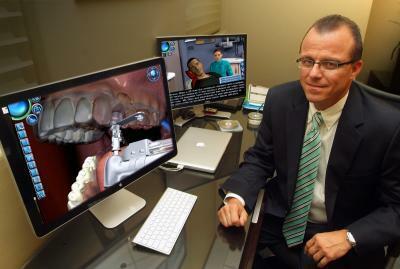 He worked with Jeppsen and his team to build complexity into the virtual patients: each one appears in two to four scenarios that showcase different clinical problems and states of mind. Before taking on the dental simulation game, Jeppson worked on Command and Conquer, a futuristic battle between humans and aliens. It's the same type of work, he said, just for a different audience. Jeppsen likens the dental simulation to choose-your-own-adventure games, "not totally cutting edge, but close enough that you get a feel for the person that you're interviewing." Of course, there's a technical component to the work. VDIT players choose the sequence of the drills for the implant procedure and then watch it happen according to their instructions. Using the wrong drill in the incorrect order will make the virtual gums explode in blood. Jeppsen wants more of that in the next iteration. Not for the gore factor, but to illustrate margins of error. "You could break the jaw if you over-torque it," said Jeppsen, "but it's not necessarily shown in the game." Which goes back to a credo he picked up from Cibirka: "It's not the carpentry we're trying to teach, it's the decision-making process."